Earlier this week, EA launched an indie bundle. Not-so-coincidentally, the Internet proceeded to explode, and I’m now typing this while holding a tin can with a piece of string attached next to my PC. I even said some things about it, though admittedly, mostly to kick off a discussion about an only partially related topic. 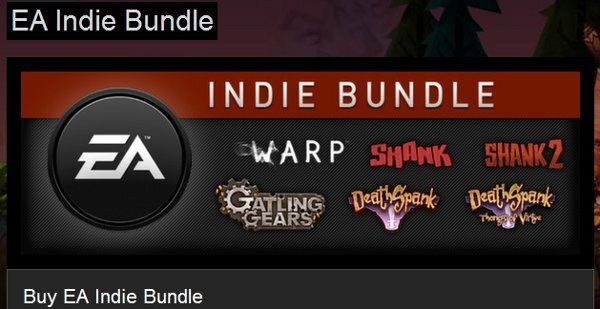 However, off the back of that, I ended up getting in touch with Klei Entertainment technical designer Nels Anderson, who directly worked on four> of the six games (both Deathspanks, both Shanks) featured in EA’s bundle of befuddlement. And while he agrees that the name itself is “a little gross,” writing off the whole thing as yet another bile-drenched belch from a money-devouring giant would be to turn a blind eye to some pretty enormous benefits for the developers involved. EA Partners is not EA proper. It seems like an insane notion, but here’s the short version: “total creative independence.” And the long version? Well, it’s quite a bit more complicated than that. And it’s after the break. Hothead Games, sans Ron Gilbert, have released the first visual details of their next game, The Baconing. Which is of course a DeathSpank game. But oddly one that absolutely does not mention DeathSpank in the title. Here DeathSpank tries on all his underwear at once, which as we all know summons an evil version of yourself, in his case the AntiSpank. And they say that gaming is immature. There’s pics and a trailer below. The Hitchhiker’s Guide To The Galaxy is not the only game Hothead is currently working on, it transpires. Those man-fellas and lady-fellas are also turning their attentions to a third DeathSpank game. DeathSpank is, you might recall, the creation of former Lucas Arts heroman Ron Gilbert; he’s now reunited with former colleague Tim Schafer at Doublefine, with Hothead confirming to Kotaku that the ‘Spank will be entirely their own work. It is called The Baconing, it is promised to be major improvement upon the first two games, and it features (in fine, crappy superhero comic tradition) The Anti-Spank. Ron Gilbert’s comedy Diablo-alike, Deathspank, is out now on Steam for £9.99! I mean, technically it was also out yesterday on Steam for £9.99, but it’s RPS’s firm belief that news gets better with age. You know, like fine wine, or the Bond films of Roger Moore.